Big thanks goes out to Amy of Cooking With Amy for hosting the 22nd edition of Is My Blog Burning. She’s chosen noodles as the theme for this month. My wife S and I really enjoy making fresh pasta from scratch. We also like putting together delicious sauces to eat with our freshly-made pasta. We’ll go to our favorite butcher and vegetable stall, looking out for produce that inspires us to tie on our aprons and spend a few hours cooking away. There’s very little as rewarding as enjoying a plate of homemade pasta with a slow-cooked sauce that you’ve lovingly labored over. Of course, there are other times when you need a plate of pasta right away. When S and I get those “I need to eat something awesome right now” cravings, we throw together a couple helpings of Roast Duck Pasta. This is one of our favorite almost-instant meals. So long as you can get your hands on an order of roast duck from a nearby Chinese takeaway or roast meats stall, you can whip up this delicious dish in a matter of minutes. To make this, you’ll need, as mentioned, some roast duck. When you buy it, ask for some of the duck sauce. You’ll also need some pasta (I suggest angelhair or linguine), an onion, some garlic, a little olive oil and some hoisin sauce. Chicken stock and spring onions are good optional additions. Shred the duck, reserving a few nice slices to place on top of the pasta. Dice the onion and garlic. In a saucepan, heat a little olive oil. Then cook the onion and garlic until soft. In a bowl, mix some of the duck sauce with a splash of olive oil, some hoisin, and if you like the taste, some chicken stock. Pour this over the onion and garlic. Add the shredded duck into the saucepan, stir everything together and cook until the meat is warm. Cook the pasta and when al dente, drain it and stir it into the sauce. Plate the pasta, topping with a few slices of the duck and if you enjoy the taste, some chopped spring onions. Of course, this dish is highly adaptable. In the pictured version, I’ve sprinkled some steamed salted duck egg’s yolk. It’s also great with some chili. The great thing is, from start to finish–given you have all the ingredients–you can make this in less than 10-15 minutes. I’m also purposely not giving any exact measurements here because I believe that everyone has his or her own tastes and should be able to decide for him or herself how much duck sauce or hoisin or stock to use. Because this dish is easy to make, it’s also great to use as a course during a multiple-course dinner. After all, there’s no point killing yourself when entertaining friends or family. I find that it’s best to plan a couple intricate dishes, interspersed with equally delicious but easy-to-make ones. For Chinese New Year this year, S and I hosted and cooked my family’s reunion dinner, as we have for the past few years. We planned a 6 course dinner, of which the duck pasta dish was the 5th course. The entire menu, for the curious, consisted of egg cocotte with foie gras and truffle salsa; a trio of ngoh hiang and foie gras; prawns with a salted duck egg yolk crust, shimeji mushrooms and spinach tofu; shark’s fin soup with abalone and crabmeat; Teochew braised duck pasta; and a candied walnut ice cream sandwich, orange-Bavarian timbale and caramelized tangerines. We were also fortunate that a close friend had given us a Teochew-style braised duck, which we used for the pasta (braised duck works just as well as roasted). It was, as it always is, fantastically tasty and a snap to make. looks awesome! Happy New Year! Hi Aun & S – it looks extremely appetising! Great picture too. I can’t believe I missed the noodle theme, I just can’t live without them. I used to do something similar with roast duck but in a risotto instead. I will have to try it with noodles as well. I love noodles too.. In Turkey chinese or japanese style noodles are quite new (except from the chinese restaurants) but pasta itself is quite beloved for turkish people. hi, the roast duck noodles, along with everything else at dinner, was utterly delicious! thanks for a wonderful meal, and happy lunar new year! Nha: Thanks. Happy New Year as well. Keiko: Thanks. Well, I’d skip the noodle theme for a slice of your Riviera any time. Cin: Mmmmm… roast duck risotto also sounds great. J: Glad you enjoyed it. Truth be told, S and I thought that some of the dishes could have been better. Khaokaprowmoo: Some times, less is more. And when you have great ingredients, the simplest things are often the best. 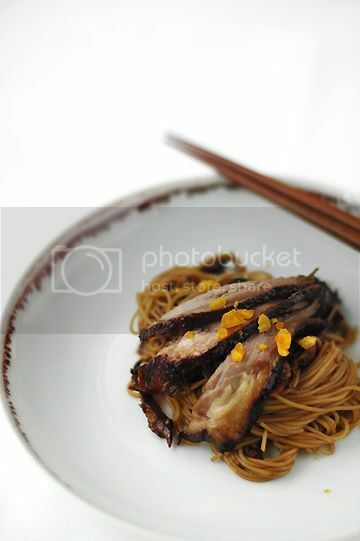 Dish look super yummy and easy~ Never imagine using the duck sauce to make another sauce for pasta. Very creative!!!! But I have to post a comment this time cause I really want to know whether you can share your recipe of making prawns with a salted duck egg yolk crust. I love eating this but have no idea how to make it. Please share the recipe when u have time, thanks! That looks delicious! I once had pasta with roast duck and fell in love with the dish! I can only imagine how yours tastes. This reminds me of the recipe in Neil Perry’s “Food I Love”, Parpadelle with Duck Ragu which just looks stunning. Much like your dish here! Yippeee! I love duck anything and this looks so yummy & simple I think I just HAVE to make it! And the salted egg yolk recipe is smashing. Will try that too. I should stop reading your blog. I keep seeing things I can and will make. Not helping me lose weight. Excellent blog/site! I hope you don’t mind if I put a link of your blog in mine! thanks for the prawns with a salted duck egg yolk crust recipe. I will definitely have a try when i have time. Hey Chubby, could I ask why you need to steam the egg yolk first before mashing? Is it to soften it? But wouldn’t it harden again upon cooling? My M told me that she tried a similar dish in UK before, they called it ‘Marco Polo’, and used Penne pasta. She’s been trying to recreate the dish but have not gotten around to buying the duck yet. Thanks for the recipe! Will try to get her to cook it so I can try begging! My friend and I just went on a short Chubby Hubby tour of Singapore recently. This is, if you haven’t guessed, an itinerary based on some of the cafes, restaurants or bakeries that you featured in your posts 🙂 Our focus were on some of the mid-priced places, nothing too expensive. We started with dinner at Buko Nero. We were lucky to get a table! We had the prawn/crabmeat pasta, tau kwa tower and a focaccia crusted cod. They were all delicious and people were friendly. We loved the place. The next morning we went to the Tekka Market to check on some of the seasonal fruits that they had at the cute Chee Boon (sp?) stall. I was hoping for Japanese strawberries but they didn’t have any. What they did have were impossibly fragrant Korean musk melons, Israeli pomegranates, Taiwanese pears, huge New Zealand cherries, Australian white peaches and some of the sweetest miniature Mandarin oranges. Gosh, Singapore gets the best fruits in the world. We bought them all. Awesome. Next, it was Iggy’s for lunch. We had the 5-course tasting menu. A fellow Malaysian waited on us at the counter! We had the wagyu burger (truly sublime), tofu with pumpkin/sesame oil, angel hair pasta with shrimp oil and roe, dishes with white truffles, mushroom capuccinos, pineapple souffle, molten chocolate cake…we were in heaven. This must be one of the best restaurants in Singapore. For the quality of the food, it’s the best value for lunch, in my opinion! For dinner we went to PS Cafe. It was busy! The place is stunning in the way that it looks casually put together. (Of course it was not. Careful planning of every little decor detail, I’m sure.) Love the chic old Danish chairs. The food was good too, but we forgot what we had! The next morning we stopped by at Canele to get some macaroons to take home – we bought all that was left on the counter. It was an amazing trip, thanks to you CH! We really appreciate it! Make sure you check out the Four Seasons in Bayswater, London, if you’re ever over my way. Best duck I’ve ever had – my husbands family come all the way from KL to have it! Monkey-gland: Hmmm… must try Mr Perry’s dish. Cheers mate. Cusinero Ge: Of course. Thanks so much. MM: By steaming the yolk, it makes it easier to crumble in little pieces, which makes it easier to cook into the butter for the sauce. If it was raw, it would be kind of messy. Mom2Ashley: I use a Nikon D70 (Nikon, c’mon, sponsor me!). Yasin: Wow. That’s so cool. I’m so glad you had great experiences at all these places. Thanks so much for reading. I really do not know what’s gotten into me. All I can say is that I think I fell in love with food ever since I started reading your blog! It is truly inspiring to have a blog that is so in love with food! I love the Four Seasons duck as well but it’s been different even since the original chef left the restaurant in 2004 (together with half of the waiting-staff) due to a dispute with the owner. Not many people are aware of this. The duck is still good but there are some subtle differences.